Q: What was the Beast's actual name? Q: Is the prince really eleven years old when the spell is cast? 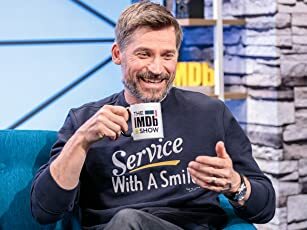 Q: What are the differences between the Theatrical Version and the Special Extended Version? I've not seen the newly added song sequence (Human Again) featured in the latest IMAX version so my comments are based entirely on the original theatrical and VHS release. 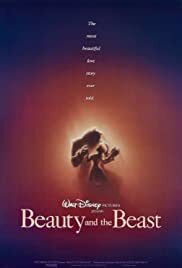 BEAUTY AND THE BEAST is Disney at its peak. From the stained glass window at the opening and the beautiful narration, the viewer is drawn into the story by the appealing music and clever lyrics ("Belle's Song") which gets the picture off to a bouncy start. 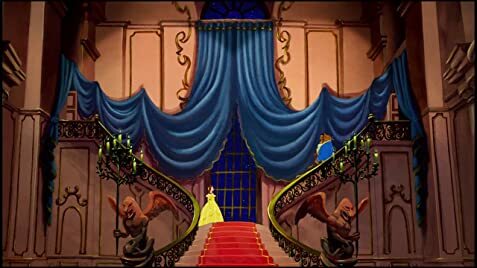 The opening sequence showing Belle and the townspeople in song is masterfully handled and choreographed for maximum effect, setting the tone for the entire story. The plot becomes thicker once Belle's father enters the castle grounds where the Beast resides. The castle interiors are brilliantly Baroque and the odd characters inhabiting the grounds are delightfully rendered by a perfect blending of art and voice talent. Cogsworth, Lumiere and Mrs. Potts are delightful creations, each with strong, consistent personalities. David Ogden Stiers, Jerry Orbach and Angela Lansbury cannot be praised enough for their contributions. Two of the musical highlights are Orbach's dazzling job on "Be My Guest" (with French accent) and Angela's tender rendering of the title song, "Beauty and the Beast". Unforgettable movie moments. As Gaston, Richard White's robust baritone voice adds greatly to the effectiveness of his villainy. It's no wonder the film was the first to receive recognition by the Academy with a Best Picture nomination. Outstanding in every department, including the end title song sung by Celine Dion and Peabo Bryson in a more "modern" style. Along with SNOW WHITE and SLEEPING BEAUTY, a top-notch fairy tale with its appeal evenly divided between adults and children--as well as the child in all of us. 87 of 102 people found this review helpful. Was this review helpful to you?